North Scottsdale is known for pristine Sonoran Desert landscapes, spectacular city views, the McDowell Mountains, renowned golf courses, and so much more. But above all, it’s known for luxury. And two communities synonymous with North Scottsdale luxury? DC Ranch and Silverleaf. They might be two of the most upscale and exclusive neighborhoods in all of North Scottsdale and Arizona. 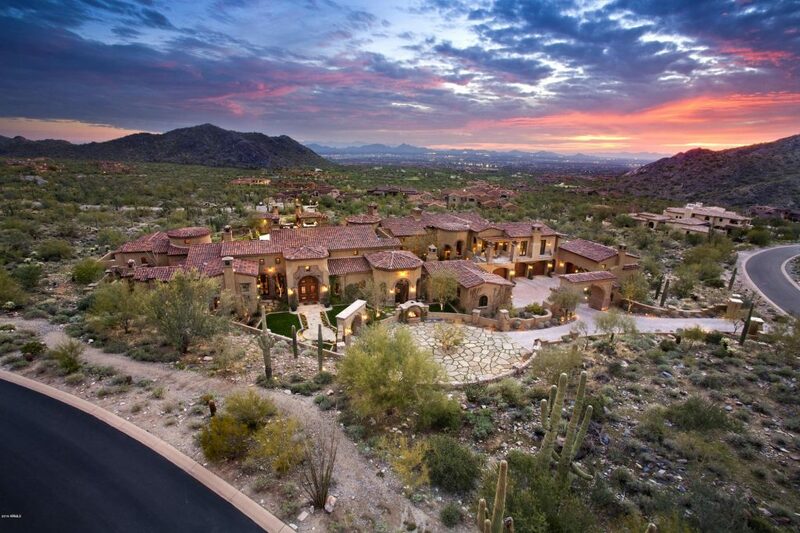 A private golf and luxury community, DC Ranch spans 4,400 acres and hugs the McDowell Sonoran Preserve. DC Ranch sits north of Frank Lloyd Wright Blvd and the 101 and is east of Scottsdale Road. Tucked into the mountains, its elevation ranges from approximately 1,500 feet to nearly 4,000 feet. DC Ranch holds one of the highest appreciation values of other luxury neighborhoods at $3.8 billion. Custom homes, master-planned estates, European-style manors, and other high-end properties make up the real estate landscape here. Rounding out a luxury desert lifestyle is Market Street at DC Ranch. Market Street ties together some of the city’s best restaurants, boutique shops and high-end office space in charming, meticulously designed buildings. Located on the corner of Pima Road and Thompson Peak Parkway, it’s an elevated town center and gathering place that anchors the luxury community. Fleming’s Prime Steakhouse & Wine Bar, which has become a luxury staple with the finest aged steak and freshest seafood. The Living Room Wine Café & Lounge, a local wine bar known for its global wine list and “open-air” setting. The Herb Box, an award-winning kitchen focused on whole foods with culinary roots in Paradise Valley and North Scottsdale. Market Street Kitchen, which features New American fare in a chic, industrial setting. Cedar Room Fine Cigars & Lounge, offering carefully selected and exclusive cigars, wines, ports and more. Hyde Park Fine Rugs, which features the latest and highest quality rugs from all over the world. Airpark Bikes, a local business building custom bikes: mountain, road, triathlon and more. And DC Ranch residents certainly enjoy their bikes and other outdoor activities. The nation’s largest urban land preserve, McDowell Sonoran Preserve has 142 miles of scenic and accessible trails for bikers, runners and outdoor enthusiasts alike. DC Ranch is also the setting for the annual Tour De Scottsdale 30- to 70-mile bike rides. When not hitting the trails, one can find residents getting in shape and relaxing at DC Ranch Village Health Club and Spa. It’s also a favorite networking spot for the who’s-who of North Scottsdale. And with more than 82,000 square feet, there’s plenty of space for fitness, friends and pampering. Another local hot spot is, of course, the golf course. It was designed by golf legends Tom Lehman and John Fought — both of whom are Scottsdale residents — and is known for exceptional course length, deep bunkers and challenging greens. With the McDowell Mountains serving as a stunning backdrop for each of its 18 holes, it is an enjoyable course for players of all levels. To the east of DC Ranch is another private community known for its golf. Silverleaf sits further back into the McDowell Mountains, providing exceptional privacy and unparalleled views of the city views below. It is known for its canyons and natural rock outcroppings. It’s a pristine desert setting for Silverleaf’s master-planned community and custom high-end properties. DC Ranch and Silverleaf are neighboring communities that enjoy many of the same upscale amenities, including world-class golf courses like Silverleaf Golf Club at DC Ranch. Designed by Tom Weiskopf, the award-winning 18-hole championship golf course is one of Arizona’s most exclusive. Scottsdale, Arizona is larger than many realize. From Old Town to North Scottsdale, there’s many different neighborhoods and lifestyles. Homebuyers interested in purchasing North Scottsdale real estate should work with a luxury real estate agent experienced in the desired neighborhood. And when it comes to Scottsdale real estate, DC Ranch and Silverleaf are certainly two of the most luxurious and highly desirable communities.